I’m reading your blog for 10 years, every single day, first thing in the morning. It changed me and my views on events in pretty much everything. I want to say a heartfelt THANK YOU for your titanic work, that you made available to people around the world, changing them for the better. I don’t know how you are able to wear so many hats plus write for us every single day. You are one of those few geniuses, like A. Einstein, who expand the horizons for many. Happy New Year 2019, dear Martin! I wish you and your team all the best in the new year and on for always! REPLY: I know, I seem to be addicted to work. Thank you very much for your comment. From my side, I am very glad we have so many readers in Russia. There were 37 countries represented at the WEC event in Orlando this year. 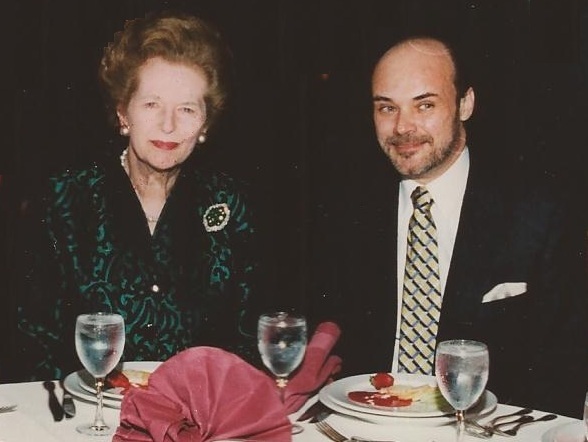 It was Margaret Thatcher who remarked to me that I reminded her of Winston Churchill. She said we both had a passion for history and we were the best at what we took interest in. Maggie told me she entered politics before 1948. She was a member of the Conservative activist “Vermin Club,” and she ran for Parliament in 1950, 1951, 1954, and finally won her first seat in 1959. She knew Churchill and served in Parliament with him as an MP for five years until Winston left Parliament in 1964. She understood cycles and even spoke at our conference back in 1996. My philosophy is we learn something from every person we meet, be it good or bad. Our clients have always been special. They are themselves all geniuses because a genius is NOT someone who knows everything. Rather, a genius is someone who looks outside the box and is not afraid to explore. By definition, a genius MUST be someone who challenges the status quo with logic. A member of the staff at Princeton University told me I reminded him of Einstein because I was curious and would always look for the answer regardless of the field. Indeed, Einstein maintained that imagination was the key. I put together the monetary history of the Roman Empire to see simply how it fell. Was it a sudden crash (Waterfall) or was it like a 747 coming in for a gradual landing. Therefore, if you are reading this blog, you MUST be in this same category. You MUST be thinking outside the box like Einstein and Churchill and seeking answers. Only such thinkers discover anything. Because of Maggie, I took the time to read up on Churchill. Those raising children should pay attention to the signs of a free thinker. “Clearly there was something odd here. 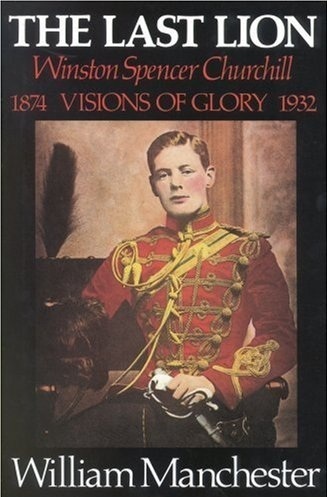 Winston, Davidson had con­ceded, was the ablest boy in his form. He was, in fact, remarkable. His grasp of history was outstanding. Yet he was considered a hopeless pupil. It occurred to no one that the fault might lie, not in the boy, but in the school. Samuel Butler defined genius as “a supreme capacity for getting its possessors into trouble of all kinds,” and it is ironic that geniuses are likeliest to be misunderstood in classrooms. Studies at the University of Chicago and the University of Minnesota have found that teachers smile on children with high IQs and frown upon those with creative minds. Intelligent but uncreative students accept conformity, never rebel, and complete their assignments with dispatch and to perfection. The creative child, on the other hand, is manipulative, imaginative, and intuitive. He is likely to harass the teacher. He is regarded as wild, naughty, silly, undependable, lacking in seriousness or even promise. His behavior is distracting; he doesn’t seem to be trying; he gives unique answers to banal questions, touching off laughter among the other children. E. Paul Tor-rance of Minnesota found that 70 percent of pupils rated high in creativ¬ity were rejected by teachers picking a special class for the intellectually gifted. The Goertzels concluded that a Stanford study of genius, under which teachers selected bright children, would have excluded Churchill, Edison, Picasso, and Mark Twain. So I thank one and all. We now have readers in more than 100 countries. We are all connected and perhaps we can contribute when the time comes. We are all in this mess together albeit not by our own actions or choice. But just remember, you can lead a horse to water but you cannot force him to drink. We, unfortunately, are in that position. We cannot change the outcome. Nobody will listen. We must remain patient and firm. When the time comes for the crash and burn, then and only then will we have a fleeting moment to turn the course of history in the right direction. We must grasp one thing. The rational components of human knowledge stand in opposition to all propositions that are arrived at by purely unbiased logical means derived from empirical research, and, in truth, they are completely void of all reality. The talking heads believe they must assign some rational explanation to every move in the markets. They only perpetuate myths and are just void of any reality or logic in the absence of empirical research in favor of presumption. They lack any understanding of the bell curve effect and it is like wine. A glass of red wine is good for the heart. A bottle of red wine is bad for the liver. Anything can kill you if taken to extremes – cold as well as heat. 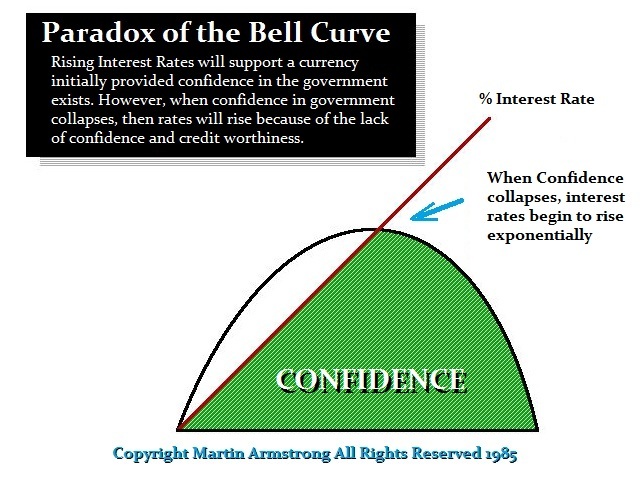 Just remember the bell curve – all things possess a cycle.